How to make a third wave Irish Coffee. John Birdsall asks Nick Cho, co-owner of Wrecking Ball Coffee Roasters and Christopher Owens, who founded Handsome Coffee Roasters (Blue Bottle acquired it in 2014), to help him reconfigure a third wave Irish coffee for a San Francisco of microroasteries and craft cocktails, where only an echo of Irishness still sounds. Our update of the version at the Buena Vista Café calls for good-quality whiskey and half as much coffee. The idea is to fuse complementary aromas. Use a single (or pure) pot still Irish whiskey, such as Redbreast 12 Year. The ideal coffee should have a medium or medium-light roasting profile and a sweet, floral nose with low or moderate acidity—we used an Ethiopia Sidama for testing. 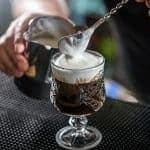 Irish coffee needs no garnish, but if you’d like, grate a little nutmeg over the top, or sprinkle with pulverized Darjeeling tea leaves. Take a clear tempered (heat-proof) glass with a volume of at least 5 ounces (a Duralex Picardie tumbler is perfect, although a small coffee mug will serve). Heat the glass by filling with hot water. Wait 30 seconds, then drain and dry the glass. Add the sugar, whiskey, and coffee to the warmed glass. Stir to dissolve the sugar, about 10 seconds. Slowly pour the whipped cream over the back of a spoon so it lands gently—it should float on the whiskey-and-coffee mixture. Add enough whipped cream to measure about ½ inch in the glass. Sprinkle with the optional nutmeg if using, and serve immediately.